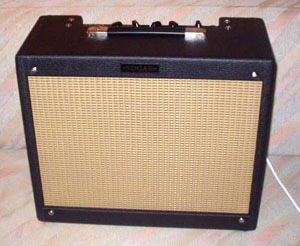 The Fender Tweed Deluxe is an amp made famous by many blues and rock players. It's almost impossible to imagine Neil Young or early Billy Gibbons without one in their backlines. The Deluxe's big brothers are the ones fetching the big bucks, but the Tweed Deluxe is getting there to. Finding good sounding and working examples is getting harder and harder. This of course makes these amps perfect candidates for boutique outfits to clone. Sixten Forsén is the designer behind the Edgar D-lux. He's chosen a different path compared too many boutiquers. The D-lux comes as a kit, not a finished amp. 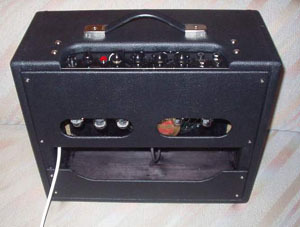 It's based on the 5E3 "Narrow Panel Tweed Deluxe", but uses Hammond chassis and transformers, which makes it a bit different than the original. The whole idea behind it is to create a kit that anyone with just basic technical knowledge can put together. Another important part of the concept was; the kit must be "voodoo free", meaning that each kit should sound the same. No secret ingredients or "magic fingers" involved. All components are high quality without being "over the top". The fiberglass board is made by Kevin O'Connor's company London Power, and it's very "tweak friendly". Kevin has also been a big inspiration for Sixten. He's even given some suggestions concerning the design of the amp. All in all the kit includes everything but the cabinet and a speaker. Sixten also builds cabinets with the speaker of your choice fitted. There's also a wide range of tolex and grill cloth types available. The first time I tried the D-lux was at the Stockholm Guitar Show last fall. It was standing on the floor in the middle of a number of great amps, looking a bit lost. It took until late in the afternoon before I tried the amp. All of you who's played a Tweed Deluxe knows how bone simple it's laid out. Four inputs, two volumes and a master tone. On the D-lux Sixten has added a knob to control the amount of negative feedback. It can be switched out of the circuit like the original or used for continuously increasing the negative feedback. One thing that makes the D-lux even more different than its older relative, is that you can choose what type of preamp tube to use. There are sockets for the traditional types like the 12AY7, but also for octal types like the 6SL7. The phase inverter can also be changed to an octal tube. I also tried different rectifier tubes. The amp comes with a 5Y3GT, but I swapped it with a GZ34. The latter sounded better to me. It had more power and head room. I played a lot of guitars through the D-lux, from Teles to Les Pauls. It sounded great with every one of them. When experimenting with different preamp tubes I discovered that I preferred the octal ones. The standard tubes sounded more traditional with some more sag and less defined bass. Changing over to the 6SL7's I got a much clearer and harmonically more complex midrange. Crunchier is probably the right word. You could say it took on a more "British" character, which I like. The negative feedback loop control is a really a great addition to the design. When off it sounds as it should; Big and raw, when used it tightens up the bass and decreases the gain. Perfect if you have a hot humbucker that needs taming. The D-lux has all the characteristics the Tweed Deluxe have, but sounds more refined. We did compare it to an original and the old amp sounded a lot smaller and gnarlier. The Tweed did have something. A more vintage feel you might say, but the D-Lux was plainly bigger and bader. If you're looking for an amp that has a big tone and a nice crunch without getting you (or worsen your) tinnitus, this might be it. If you know your way around a soldering iron you can put together a boutique quality amp all by your self.